In the everyday world around us, we observe three very different types of materials: gases, liquids, and solids. Closer examination of the physical properties of homogeneous crystalline solids shows that they can be subdivided into four distinct categories according to their physical properties and the different forces holding them together. For each category, we must develop a bonding picture, based on electrons, that will lead to an understanding of the physical properties exhibited. We can classify the solids according to the distribution of the valence electrons of the atoms (as shown in Figure 1), which explains their physical properties. Metallic. A metal is a substance that can conduct electricity both as a solid and when it is molten. The range of melting points for metals is very large, from −39°C for mercury to 1,083°C for copper and 3,200°C for tungsten. The outermost valence electrons of the atoms belong to the crystal as a whole, delocalized as a "sea" in which they are freely mobile to flow from atom to atom. The positive nuclei of the atoms are embedded in the sea as a close-packed three-dimensional array. Figure 1. Schematic representation of the packing of the atoms and the electron distribution in the four types of solids. Ionic. Ionic materials are those that are brittle and that conduct electricity when molten but not as solids. Melting points range upwards from about 500°C. Examples are CaO (quicklime), MgF 2 , and NaCl (common table salt). The electrons are constrained about each atom, some atoms with excess positive charge (cations) and some with excess negative charge (anions). The ions are packed closely together, held by coulomb (electrostatic) forces of attraction. Covalent network. A solid that is extremely hard, that has a very high melting point, and that will not conduct electricity either as a solid or when molten is held together by a continuous three-dimensional network of covalent bonds. Examples include diamond, quartz (SiO 2 ), and silicon carbide (SiC). The electrons are constrained in pairs to a region on a line between the centers of pairs of atoms. Van der Waals molecular. A material that has a very low melting point and that will not conduct electricity either as a solid or when molten consists of molecules that are close-packed, bump-in-hollow and that are attracted to each other by weak van der Waals attractions. Examples include carbon dioxide (CO 2 , dry ice), iodine (I 2 ), and naphthalene (mothballs). The electrons are constrained to the well-defined groups of atoms that constitute the molecules. The atoms within the molecules are linked together by strong covalent bonds. The weak attractions between the molecules, termed London forces, arise from the charge asymmetry in the molecules that result from the polarizability of their electron clouds. because these are the properties that characterize the four extreme types of bonding. Figure 2. 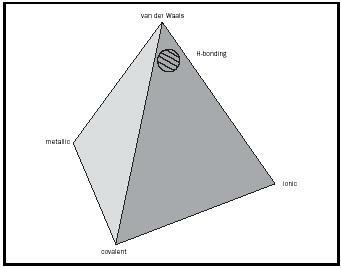 The tetrahedron of bonding types. Typical examples are: metallic-copper; ionic-NaCL; covalent network-diamond; van der Waals, molecular-iodine. Hydrogen bonding would be represented by the cross-hatched area near to van der Waals types of bonding. In many metals, each atom is in contact with twelve others: six in a plane, three above, and three below. 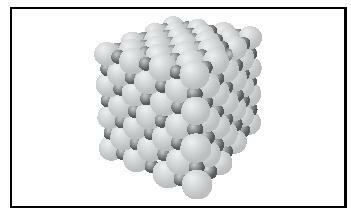 These are termed close-packed hexagonal(e.g., magnesium), or face-centered cubic (e.g., copper). In other metals (e.g., iron), each atom is in contact with eight others at the corners of a cube; such structures are called body-centered cubic. To a first approximation, we expect that the melting point of the metal should be related to the number of valence electrons that each atom contributes to the "sea." Two series of metals, as outlined in Table 1, illustrate the effect. The simple model fits observation remarkably well for pure metals. However, this model begins to fail for alloys (solutions of one metal in another), such as brass and bronze, where for certain stoichiometries the material has anomalous physical properties and behaves almost as a compound(e.g., CuZn and Cu 5 Sn, termed Hume-Rothery electron phases). Table 1. Melting points of metals. Table 2. Properties of ionic compounds. When two elements of very different groups in the Periodic Table react (e.g., the metals Na and Mg from Groups 1 and 2 on the left side with the nonmetals O 2 and Cl 2 from Groups 6 and 7 on the right side), the product is a solid (usually colorless) that has a high melting point. The product is an insulator but will conduct electricity in the molten state. The solid is built of alternating positively charged cations and negatively charged anions, packed tightly together, the exact pattern depending on the charges on the ions, q + and q − , and on their relative sizes—the radius ratio r + /r − . In general, the metal atom loses electrons to leave a cation with a closed shell—an octet, at the cost of the ionization energy (IE): Na° − e − → Na + . A halogen atom will acquire an electron to form an anion with a closed shell, releasing energy, the electron affinity (EA): F + e − → F − . A large value of the lattice energy indicates very strong bonding in the solid, hence a high melting point, and insolubility in water. The face-centered cubic structure adopted by the ionic compounds NaCl and MgO is shown in Figure 3. The small spheres represent the cations, and the large spheres represent the anions. Figure 3. Face-centered cubic structure of NaCl and MgO crystals. Figure 4. Electron pair bonding in simple molecules. Each H atom shares two electrons, each of the other atoms has four pairs. This type of bonding is found between pairs of similar atoms, especially among those in the upper right hand corner of the periodic table. For example, C–C in hydrocarbons, S–O in sulfur dioxide, C–F in Freons. The bonds can give rise to three-dimensional structures like diamond, and are found in simple molecules like H 2 S. These bonds are strong, and result in molecules with fixed geometry, such as methane, and give rise to optical activity in molecules such as lactic acid where the C atom is rigidly bonded to four different groups. Pairs of electrons. Covalent bonding occurs between two atoms as a result of the sharing of a pair of electrons between the atoms. An example is provided in Figure 4. Figure 5. Octet of electrons about the carbon atom in diamond. Each straight line represents a localized two-center two-electron bond. In the ammonia molecule, one pair of electrons on the nitrogen atom is not involved in directly bonding to the H atoms; this is termed a lone pair. Unfortunately these Lewis diagrams can say nothing about the shape of the molecule. This comes much later by the Sidgwick-Powell/Gillespie/Nyholm-VSEPR approach to molecular geometry. The three molecules obey the octet rule, and in each case all of the electrons are paired. The experimental facts show that for oxygen this bonding picture is wrong: Oxygen is paramagnetic; that is, the molecule has two unpaired electrons. This simplistic picture has failed, and a new approach to covalent bonding is required. There are two other approaches to understanding covalent bonding: the molecular orbital (MO) theory and the valence bond (VB) theory. The VB approach is useful when considering molecular geometry. The MO approach is important when considering electronic spectra and other energy properties of the molecule. These topics are discussed separately. Hybrid atomic orbitals and shapes of molecules. The valence electrons of the light elements lithium to fluorine are distributed in atomic orbitals 2s, 2p x , 2p y , and 2p z , whose shapes are given in Figure 6. Figure 6. 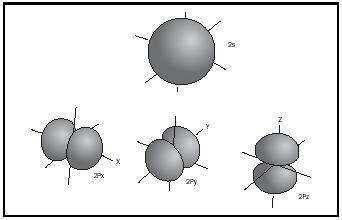 Shapes of atomic orbitals: s, p x , p y , and p z . Figure 7. Formation of two sp hybrid orbitals resulting from the combination of one s and one p atomic orbital. Table 3. Physical properties of three simple hydrocarbons. All three compounds burn in air. Acetylene is used for welding; ethylene is polymerized to give polyethylene, a plastic common in every kitchen. Molecules, such as ammonia, that have a lone pair of electrons are able to donate these two electrons to an empty orbital on a metal atom, to form a coordinate or dative bond. A typical example is the deep blue coordination complex of copper, [Cu(NH 3 ) 4 ] 2+ , which has four Cu(NH 3 ) bonds in a square plane. Similarly, a proton will attach itself to the lone pair of electrons on the ammonia molecule to give the tetrahedral NH 4 + ammonium cation. The lone pair on the N atom in N(CH 3 ) 3 will bond to the empty orbital on the B atom in B(CH 3 ) 3 to give the compound (CH 3 ) 3 N–B(CH 3 ) 3 . The F − anion will donate a pair of electrons to the B atom in the BF 3 molecule to form the tetrahedral BF 4 − anion. This type of bonding where one atom, the donor, supplies both electrons to form the bond to the second atom, the acceptor, is termed Coordinate, or sometimes Dative. Materials held together by van der Waals attractions often have a smell at room temperature (e.g., camphor and menthol). This is caused by the molecules escaping from the solid and subliming directly into the gas phase . The attractive forces between the molecules are weak. These forces arise from distortions in the electron cloud around the molecule, which cause some parts to be relatively positively charged, while other parts are relatively negative. Depending on its shape, the molecule as a whole can have a dipole moment μ . For instance, for BF 3 , μ =0 because BF 3 is trigonal planar, while for NF 3 , μ =0.23 D, because NF 3 is pyramidal . The presence of a dipole moment in a molecule results in attractions between pairs of molecules, termed Keesom forces. Polarizability. More interestingly, neutral molecules with a zero dipole moment are mutually attracted to give liquids (such as CCl 4 ) and solids (such as naphthalene). These attractions, termed London forces or dispersion forces, arise from the ease of distortion of the electron cloud of the molecule as a whole. This is termed polarizability and is related to the volume of the molecule and the number of electrons in the valence shells of the atoms on the exposed surface of the molecule. The net effect (surprisingly, perhaps) is large and accounts for the relatively high melting points of iodine, CO 2 (dry ice), and naphthalene. These London forces are important; they are the attractions between the long-chain polymeric molecules in solid polyvinyl chloride (PVC) and polyethylene. Table 4. Physical properties of simple compounds. Figure 8. 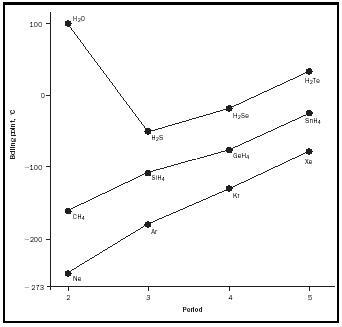 Plot of the boiling points of simple molecules MH x , versus the position of M in the Periodic Table. that hold water on a cotton facecloth and that are the forces between the base pairs in the DNA in our bodies. There are many homogeneous materials in which the bonding cannot be described simply as one of the four extreme types. The bonding in these materials is intermediate in character. For example, tin at room temperature is metallic in nature, but on cooling, it totally changes its electronic structure and adopts the diamond structure. A small change in energy nudges the tin atoms over the edge as the bonding teeters on the brink between metallic and covalent. It was this change that caused the tin buttons on the great coats of the soldiers of Napoleon's Grande Armée to crumble, during the terrible retreat from Moscow in the winter of 1812. The element gallium is not truly metallic. In the solid, each gallium atom has one short bond of covalent character, and six other much longer contacts to neighboring atoms, intermediate in character between metallic and van der Waals, similar to the structure of crystalline iodine. The six intermediate types of bonding are not easy to describe, but in fact they are often the most important and certainly are very interesting. Alloys. Many alloys have structures in which the atoms of the different metals are ordered. Hence they behave like compounds (e.g., AuCu 3 and Cu 5 Zn 8 ). CsAu has the NaCl structure (see Figure 3) and behaves almost as if it were ionic, Cs + Au − . This corresponds with the low ionization energy of Cs, 376 kilojoules per mole, and the favorable electron affinity of Au, 223 kilojoules per mole. CsAu's bonding would lie along the metal/ionic edge of the tetrahedron of bonding types. Semiconductors. Semiconducting materials are of great practical importance in electronics. Ge, GaAs, ZnSe, and CuBr, are examples and they have bonding that can be described as intermediate between ideal covalent and ideal ionic. Each atom is bonded to four others in a tetrahedron, the zinc blende structure. Silicate minerals. The bonding within a solid is always reflected in its physical properties, and this relationship to its internal structure is beautifully displayed in the morphology of the series of silicate minerals: quartz, mica, and asbestos. In quartz there is a three-dimensional network of Si—O bonds. In mica there are negatively charged infinite sheets consisting of a two-dimensional network of SiO 4 units, with the sheets linked by cations. In asbestos, there are infinite negatively charged chains of tetrahedral SiO 4 units with strong covalent Si—O—Si bonds. The chains are attached to each other via cations. These latter two solids are each held together by two types of bonds, and the difference between the very strong covalent bonding and the other weaker attractions is evident. Mica is easily split into sheets, whereas asbestos consists of fibers. Glass. Ordinary glass is an amorphous solid, constructed of negatively charged fragments of nets of SiO 4 units that are linked by Na + and Ca 2+ cations. There is no internal order. As a result, glass shatters to give curved surfaces; and it gradually softens on heating and does not have a sharp melting point. The bonding in ceramic materials (such as bricks, tiles, pottery, and insulators) is similar, predominantly ionic. It is important to remember that bonding is always accompanied by a reduction in energy, and that all bonding theory is but an intellectual model, a mental scaffolding on an atomic scale, on which to hang our ideas in hopes of giving a self-consistent explanation of observed reality. SEE ALSO Molecular Orbital Theory ; Valence Bond Theory . Adams, D. M. (1974). Inorganic Solids. London: John Wiley & Sons. Brady, James E.; Russell, Joel W.; and Holum, John R. (2000). Chemistry , 3rd edition. New York: John Wiley & Sons. Brown, Theodore L.; Le May, H. Eugene; and Bursten, Bruce E. (2000). Chemistry , 8th edition. New Jersey: Prentice Hall. de Kock, Roger L., and Gray, Harry B. (1980). Chemical Structure and Bonding. Menlo Park, CA: Benjamin/Cummings Publishing Co.
Huheey, James E.; Keiter, Ellen A.; and Keiter, Richard L. (1993). Inorganic Chemistry , 4th edition. New York: Harper Collins. Ketelaar, J. A. A. (1958). Chemical Constitution , 2nd edition. Amsterdam, Netherlands: Elsevier. Olmsted, John, and Williams, Gregory M. (2002). Chemistry , 3rd edition. New York: John Wiley & Sons.